Shoes & Tattoos: Fashion Forum Friday: Audience Participation Day! Seriously, Participate! Fashion Forum Friday: Audience Participation Day! Seriously, Participate! As Thursday evening draws to a close, my excitement is always piqued by the anticipation of Blinn’s denim Friday and my well rested weekend wear. Typically, one item will stand out in my mind and foster my excitement, and I begin to plan strategic outfits showcasing said item. As Zoe would say, “It’s major.” It’s part of my weekend joy. Endorphins are released into my system when I picture it. The item changes every weekend. What am I excited about this weekend? 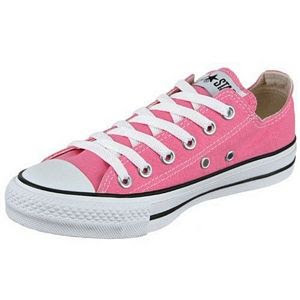 I’ve finally capitulated to the siren song of the pink converse. As I’ve said before, I often just want to wear heels, but sometimes a pair of shoes possesses such potent character that they could be -3 inches (I kid, I kid!) and still make a statement. One of my favorite fashion statements is to sport brightly colored footwear because they essentially match with nothing, and therefore, can almost go with anything. Heed that “almost”, there. If you do run out and pick up a pair of vibrantly colorful shoes, please don’t coordinate your entire ensemble using the same matchy matchy color. Matchy matchiness is the death of youthfulness. Shoes and accessories needn’t match your ensemble; they need to “go” with your ensemble. This concept will change your life, Ladies, regardless of your age group. Audience Participation: What are you excited about wearing this weekend? Or what do you wish you could wear this weekend? Leave a comment and let me know. I promise I won’t steal any ideas and show up to the same event as you dressed as you…or will I? If we’re going to try to make this fashion relationship work, we’re going to have to start inspiring one another. Let me and everyone else know what item is delivering your fashion zen this weekend! I am excited about wearing my magpie necklace. It's covered in crystals and pearls, is super sparkly, and weighs approximately 10 pounds. Office appropriate? Probably not. A little bling is one thing; ten pounds of it is another. But the weekend? I can rock the shiz out of it. I am excited to wear some new hair accessories in the shape of a rose with my long curly hair and blue jeans- a total weekend must with a simple t-shirt and black sweater. Yes, I may deal with the Texas heat, but such a lovely thing to wear out- not dressy and not too casual. Also, able to chase a 23 month old nephew around as well, but really excited about the hair accessory as it is brand new to my collection. I am excited to get to wear my black t-shirt with embroidery around the neck with my favorite comfortable jeans. Perfect outfit for a work day today! Nothing like a simple, yet cute outfit that you can feel good wearing to start off your day! Thanks for sharing, Ladies! LOVE IT!